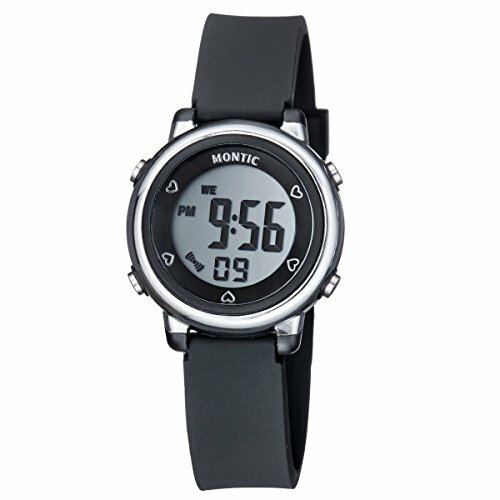 A fun sporty multi function digital watch with day and date, alarm and stopwatch functions. A 50 meter water resistant resin black and silver case and a soft comfortable rubber silicone adjustable strap. Multi function: LCD digital display, Hour, Minute, second, day and date, Hour chime and Daily Alarm,12/24H format, Auto Calendar, 1/100 second Chronograph with split function, EL backlight. If you have any questions about this product by Montic, contact us by completing and submitting the form below. If you are looking for a specif part number, please include it with your message.